To guide education policy and maintain its innovation leadership, the United States must acquire an accurate understanding of the quantity and quality of engineering graduates in India and China. Although there is widespread concern in the United States about the growing technological capacity of India and China, the nation actually has little reliable information about the future engineering workforce in these countries. U.S. political leaders prescribe remedies such as increasing U.S. engineering graduation rates to match the self-proclaimed rates of emerging competitors. Many leaders attribute the increasing momentum in outsourcing by U.S. companies to shortages of skilled workers and to weaknesses in the nation’s education systems, without fully understanding why companies outsource. Many people within and beyond government also do not seem to look ahead and realize that what could be outsourced next is research and design, and that the United States stands to lose its ability to “invent” the next big technologies. At the Pratt School of Engineering of Duke University, we have been studying the impact of globalization on the engineering profession. Among our efforts, we have sought to assess the comparative engineering education of the United States and its major new competitors, India and China; identify the sources of current U.S. global advantages; explore the factors driving the U.S. trend toward outsourcing; and learn what the United States can do to keep its economic edge. We believe that the data we have obtained, though not exhaustive, represent the best information available and can help U.S. policymakers, business leaders, and educators chart future actions. Various articles in the popular media, speeches by policy-makers, and reports to Congress have stated that the United States graduates roughly 70,000 undergraduate engineers annually, whereas China graduates 600,000 and India 350,000. Even the National Academies and the U.S. Department of Education have cited these numbers. Such statements often conclude that because China and India collectively graduate 12 times more engineers than does the United States, the United States is in trouble. The remedy that typically follows is for the United States to graduate more engineers. Indeed, the Democrats in the House of Representatives in November 2005 proposed an Innovation Agenda that called for graduating 100,000 more engineers and scientists annually. RATHER THAN TRYING TO MATCH THEIR DEMOGRAPHIC NUMBERS AND COST ADVANTAGES, THE UNITED STATES NEEDS TO FORCE COMPETITORS TO MATCH ITS ABILITY TO INNOVATE. But we suspected that this information may not, in fact, be totally accurate. In an analysis of salary and employment data, we did not find any indication of a shortage of engineers in the United States. Also, we obtained anecdotal evidence from business executives doing business in India and China that indicated that those were the countries with shortages. To obtain better information about this issue, we embarked on a project to obtain comparable engineering graduation data from the United States, China, and India. U.S. graduation statistics are readily available from the Department of Education’s National Center for Education Statistics. Extensive data on engineering education are also collected by the American Society for Engineering Education and the Engineering Workforce Commission. In order to collect similar data for China and India, we initially contacted more than 200 universities in China and 100 in India. Chinese universities readily provided aggregated data, but not detail. Some Indian universities shared comprehensive spreadsheets, but others claimed not to know how many engineering colleges were affiliated with their schools or lacked detail on graduation rates by major. In the case of China, we eventually obtained useful data from the Ministry of Education (MoE) and, most recently, from the China Education and Research Network (CERN). In India, we obtained data from the National Association of Software and Service Companies (NASSCOM) and the All India Council for Technical Education (AICTE). What we learned was that no one was comparing apples to apples. In China, the word “engineer” does not translate well into different dialects and has no standard definition. We were told that reports sent to the MoE from Chinese provinces did not count degrees in a consistent way. A motor mechanic or a technician could be considered an engineer, for example. Also, the numbers included all degrees related to information technology and to specialized fields such as shipbuilding. It seems that any bachelor’s degree with “engineering” in its title was included in the ministry’s statistics, regardless of the degree’s field or associated academic rigor. Ministry reports also included “short-cycle” degrees typically completed in two or three years, making them equivalent to associate degrees in the United States. Nearly half of China’s reported degrees fell into this category. In India, data from NASSCOM were most useful. The group gathers information from diverse sources and then compares the data to validate projections and estimates. However, NASSCOM’s definition of engineer includes a wide variety of jobs in computer science and fields related to information technology, and no breakdown is available that precisely matches the U.S. definition of engineer, which generally requires at least four years of undergraduate education. Still, the group’s data provide the best comparison. Data from the three countries are presented in Table 1. Note: Gray-highlighted data may be a substantial overestimate. We believe that both sets of data from China presented in Table 1 are suspect, but they represent the best estimates available. The CERN numbers are likely to be closer to actual graduation rates but are available for only two years. The MoE numbers do, however, reflect a real trend—that graduation rates have increased dramatically in China. To better understand the impact of the increases in gradation rates reported in China, we analyzed teacher/student ratios and numbers of colleges. As part of this effort, we visited several schools in China and met with several business executives and an official of the Communist Party. The surge in engineering graduation rates can be traced to a series of top-down government policy changes that began in 1999. The goals of the changes were twofold: to transform science and engineering education from “elite education” to “mass education” by increasing enrollment, and to reduce engineering salaries. What we found is that even as enrollment in engineering programs has increased by more than 140% over the past five years, China has been decreasing its total number of technical schools and their associated teachers and staff. From 1999 to 2004, the number of technical schools fell from 4,098 to 2,884, and during that period the number of teachers and staff at these institutions fell by 24%. So graduation rate increases have been achieved by dramatically increasing class sizes. We learned that only a few elite universities, such as Tsinghua and Fudan, had been allowed to lower enrollment rates after they noted serious quality problems as a result of increases they had made. The vast majority of Chinese universities complied with government directives to increase enrollment. Our interviews with representatives of multinational and local technology companies revealed that they felt comfortable hiring graduates from only 10 to 15 universities across the country. The list of schools varied slightly from company to company, but all of the people we talked to agreed that the quality of engineering education dropped off drastically beyond those on the list. Demand for engineers from China’s top-tier universities is high, but employers complained that supply is limited. At the same time, China’s National Development and Reform Commission reported in 2006 that 60% of that year’s university graduates would not be able to find work. In an effort to “fight” unemployment, some universities in China’s Anhui province are refusing to grant diplomas until potential graduates show proof of employment. The Chinese Ministry of Education announced on June 12, 2006, that it would begin to slow enrollment growth in higher education to keep it more in line with expected growth in the nation’s gross domestic product. Although Chinese graduation rates will continue to increase for a few years, while the last few high-enrollment classes make their way through the university system, we expect that the numbers of engineering graduates will eventually level off and may even decline. 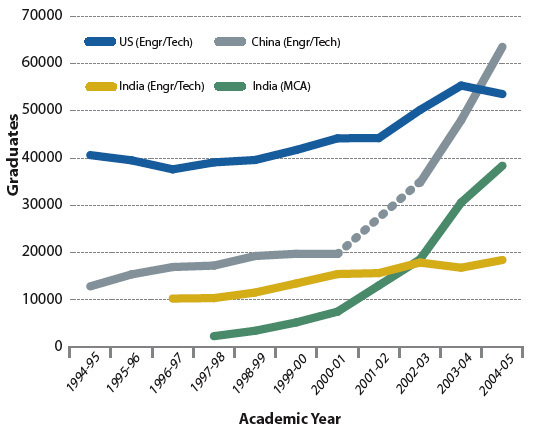 In India, the growth in engineering education has been largely bottom-up and market-driven. There are a few regulatory bodies, such as the AICTE, that set limits on intake capacities, but the public education system is mired in politics and inefficiency. Current national debates focus on a demand for caste-based quotas for more than half of the available seats in public institutions. Private enterprise has been India’s salvation. The nation has a growing number of private colleges and training institutions. Most of these face quality issues, but a few of them do provide good education. In 2004, India had 974 private engineering colleges, as compared with only 291 public and government institutions. New training centers have sprung up to address skills gaps that exist between companies’ needs and the capabilities of college graduates. NIIT, an international corporation that provides education and training in information technology in a number of countries, is the largest private training institute and runs more than 700 training centers across India. These centers serve corporations that need to train employees, as well as job seekers trying to break into the information technology industry. The company claims to serve as a “finishing school” for engineers. Among the universities funded by the government, the Indian Institutes of Technology are best known and reputed to provide excellent education. But they graduate only a small percentage of India’s engineers. For example, during the 2002-2003 academic year, the institutes granted a total of 2,274 bachelor’s degrees, according to school officials. The quality of other universities varies greatly, but representatives of local companies and multinationals told us that they felt comfortable hiring the top graduates from most universities in India—unlike the situation in China. Even though the quality of graduates across all universities was inconsistent, corporate officials felt that with additional training, most graduates could become productive in a reasonable period. Our research into engineering graduation rates raised many questions. We wondered, for example, about possible links between trends in education and the hiring practices and experiences of U.S. companies engaged in outsourcing. Were companies going offshore because of the superior education or skills of workers in China, India, or elsewhere, or because of a deficiency in U.S. workers? Would companies hire the large numbers of Chinese or Indian engineers graduating from two-or three-year technical programs? What were the relative strengths or weaknesses of engineering graduates when they joined multinationals? What skills would give U.S. graduates a greater advantage, and would offshoring continue even if they had these skills? Degree requirements. We were surprised that the majority of respondents said they did not mandate that job candidates possess a four-year engineering degree. Forty percent hired engineers with two- or three-year degrees, and an additional 17% said they would hire similar applicants if they had additional training or experience. Engineering offshore. Forty-four percent of respondents said their company’s U.S. engineering jobs are more technical in nature than those sent abroad, 1% said their offshore engineering jobs are more technical in nature, and 33% said their jobs were equivalent. Thirty-seven percent said U.S. engineering employees are more productive, whereas 24% said U.S. and offshore engineering teams are equivalent in terms of productivity. Thirty-eight percent said their U.S. engineering employees produced higher-quality work, 1% said their company’s offshore engineering employees produced higher-quality work, and 40% said the groups were equal. Engineering shortages in the United States. We asked several questions about company policies in hiring engineers to work in the United States. First, we asked about job acceptance rates, which are an indicator of the competition a company faces in recruiting staff. Acceptance rates of greater than 50% are generally considered good. Nearly one-half of the respondents had acceptance rates of 60% or higher. Twenty-one percent reported acceptance rates of 80 to 100%, and 26% of respondents reported 60 to 79% acceptance rates. Eighty percent said acceptance rates had stayed constant or increased over the past few years. It is common in many industries to offer signing bonuses to encourage potential employees to accept a job offer. We found, however, that 88% of respondents to our survey did not offer signing bonuses to potential engineering employees or offered them to only a small percentage of their new hires. Another measure of skill supply is the amount of time it takes to fill a vacant position. Respondents to our survey reported that they were able to fill 80% of engineering jobs at their companies within four months. In other words, we found no indication of a shortage of engineers in the United States. Reasons for going offshore. India and China are the top offshoring destinations, with Mexico in third place. The top reasons survey respondents cited for going offshore were salary and personnel savings, overhead cost savings, 24/7 continuous development cycles, access to new markets, and proximity to new markets. Workforce issues. Given the graduation numbers we collected for China and India, we expected to hear that Indian corporations had difficulty hiring whereas Chinese companies did not. Surprisingly, 75% of respondents said India had an adequate to large supply of well-qualified entry-level engineers. Fifty-nine percent said the United States had an adequate supply, whereas 54% said this was the case in China. Respondents said the disadvantages of hiring U.S. engineers were salary demands, limited supply of available people, and lack of industry experience. The disadvantages of hiring Chinese engineers included inadequate communication skills, visa restrictions, lack of proximity, inadequate experience, lack of loyalty, cultural differences, intellectual property concerns, and a limited “big-picture” mindset. The disadvantages of hiring Indian engineers included inadequate communication skills, lack of specific industry knowledge or domain experience, visa restrictions, lack of proximity, limited project management skills, high turnover rates, and cultural differences. Respondents said the advantages of hiring U.S. engineers were strong communication skills, an understanding of U.S. industry, superior business acumen, strong education or training, strong technical skills, proximity to work centers, lack of cultural issues, and a sense of creativity and desire to challenge the status quo. The key advantage of hiring Chinese entry-level engineers was cost savings, whereas a few respondents cited strong education or training and a willingness to work long hours. Similarly, cost savings were cited as a major advantage of hiring Indian entry-level engineers, whereas other advantages were technical knowledge, English language skills, strong education or training, ability to learn quickly, and a strong work ethic. Future of engineering offshore. The vast majority of respondents said the trend will continue, and their companies plan to send an even wider variety of jobs offshore. Only 5% said their overseas operations would stabilize or contract. To complement our survey, we also met with senior executives of a number of U.S. multinationals, including IBM, Microsoft, Oracle, and GE in India and China. All of them talked of major successes, expressed satisfaction with the performance of their groups, and foresaw significant expansion. They said their companies were responding to the big opportunities in these rapidly growing markets. They expected that R&D would be moved closer to these growth markets and that their units would increasingly be catering to worldwide needs. Our interest in globalization also led us to look at the need for and production of engineers in the United States, China, and India who have advanced engineering or technology degrees or who have pursued postgraduate training in these areas. We traveled to China and India to meet with business executives and university officials and to collect data from a variety of sources. The business executives said that for higher-level jobs in R&D, they preferred to hire graduates with master’s or PhD degrees. They did not mandate a PhD for research positions, and they said they often found many capable master’s-level graduates. Chinese executives said it was getting easier to hire master’s and PhD graduates, but Indian executives said it was getting harder. In both countries, they reported seeing an increasing number of expatriates returning home and bringing extensive knowledge and experience with them. The deans and other university officials we met, especially those at top-level institutions, talked about the increasing demand they were seeing for their graduates and the shortages they were experiencing in hiring PhD graduates for faculty positions. They reported frequently having to compete with private industry and universities abroad for such graduates. In our analysis of actual graduation data, we found that U.S. numbers were readily available from the Department of Education’s National Center for Education Statistics, the American Society for Engineering Education, and the Engineering Workforce Commission. For China and India, the picture was much different, as government officials maintained that little information on such issues is available. Still, we have accumulated some data. During our trip to China, we were able to examine reports issued by the MoE on the state of education throughout the country. These reports detail degree production across a variety of disciplines, including engineering. Unfortunately, they offer no explanation as to how their statistics are tabulated. We believe that the data are gathered in inconsistent ways from the various Chinese provinces and that there are problems with how degrees are classified and their accreditation or quality. Although we consider the data suspect, they represent the best information available on Chinese education and allow valid inferences of trends. Some MoE information is available online, but detailed data, including the production of engineering master’s and PhD graduates, are published only in the ministry’s Educational Statistical Yearbooks. These yearbooks generally are not permitted to leave China. In addition, the data are presented a year at a time and, in some cases, are available only in Chinese. In Beijing, with the help of local students, we combed government libraries and bookstores, searching for these publications. We ultimately were able to assemble 10 years’ worth of data on Chinese graduate engineering degrees. To obtain graduate statistics for India, we traveled to Bangalore and New Delhi and visited NASSCOM, the AICTE, and the Ministry of Science and Technology and University Grants Commission. From the ministry we obtained useful information about PhD graduates. Obtaining data on master’s degree graduates proved much more difficult. Although NASSCOM is considered to be an authority on India’s supply of engineering and technology talent, for master’s degree graduates it maintains data only on students who obtain a specialized degree in computer application. We obtained more data on master’s degree graduates from the AICTE, a government body that regulates university and college accreditation and determines how many students each institution may enroll in various disciplines. Each year, the body issues a report titled Growth in Technical Education that includes data on intake capacities. Current versions of the reports are readily available, but archives are difficult to obtain. The data in these reports are not published online, and paper versions of the reports rarely leave India. Our team met with a number of AICTE officials at a variety of venues to obtain physical copies of the reports covering 10 years. For various technical reasons, we could not use data from the reports directly, but we were able to adjust them statistically to obtain what we consider to be valid measurements. We validated our methodology with various AICTE representatives and academic deans. An added complication with India’s master’s degree data is that students can pursue two different master’s degrees within engineering, but graduates are often counted together. The first is a traditional technical master’s degree in engineering, computer science, or information technology. These degrees, which require two years of study, are similar in structure to master’s degree offerings in the United States and China. The second is a master’s of computer application (MCA) degree, a three-year degree that offers a foundation in computer science to individuals who previously had received a bachelor’s degree in a different field. Most MCA recipients receive an education equivalent to a bachelor’s degree in computer science. For our analysis, we included statistics on MCA degrees but separated them analytically from more traditional master’s degrees. Table 2 shows our comparative findings related to master’s degrees, and Table 3 shows our findings related to PhD degrees. Note: 2001-02 Chinese data (hashed line) from the Ministry of Education represent a significant outlier and thus were removed from our analysis. Note: 2001-02 Chinese data (hashed line) from the Ministry of Education represent a significant outlier and were removed from our analysis. In the United States, close to 60% of engineering PhD degrees awarded annually are currently earned by foreign nationals, according to data from the American Society for Engineering Education. Indian and Chinese students are the dominant foreign student groups. Data for 2005 that we obtained from the Chinese government show that 30% of all Chinese students studying abroad returned home after their education, and various sources report that this number is steadily increasing. Our interviews with business executives in India and China confirmed this trend. The bottom line is that China is racing ahead of the United States and India in its production of engineering and technology PhD’s and in its ability to perform basic research. India is in particularly bad shape, as it does not appear to be producing the numbers of PhD’s needed even to staff its growing universities. Although our research has revealed some issues of concern for the United States, we also want to focus on what we consider to be the country’s advantages in today’s increasingly globalized economy. We believe that these advantages include the United States’ open and inclusive society and its ability to attract the world’s best and brightest. Therefore, we have studied the economic and intellectual contribution of students who came to the United States to major in engineering and technology and ended up staying, as well as immigrants who gained entry based on their skills. Economic contributions. In 1999, AnnaLee Saxenian of the University of California, Berkeley, published a study showing that foreign-born scientists and engineers were generating new jobs and wealth for the California economy. But she focused on Silicon Valley, and this was before the dotcom bust. To quantify the economic contribution of skilled immigrants, we set out to update her research and look at the entire nation. She assisted us with our research. In 25.3% of the companies, at least one key founder was foreign-born. In the semiconductor industry, the percentage was 35.2%. Nationwide, these immigrant-founded companies produced $52 billion in sales and employed 450,000 workers in 2005. Almost 80% of immigrant-founded companies were within two industry fields: software and innovation/manufacturing-related services. Immigrants were least likely to start companies in the defense/aerospace and environmental industries. Indians have founded more engineering and technology companies during that past decade than immigrants from Britain, China, Taiwan, and Japan combined. Of all immigrant-founded companies, 26% have Indian founders. The mix of immigrants varies by state. For example, Indians dominate in New Jersey, with 47% of all immigrant-founded startups. Hispanics are the dominant group in Florida, and Israelis are the largest founding group in Massachusetts. Intellectual contribution. To quantify intellectual contribution, we analyzed patents applications by U.S. residents in the World Intellectual Property Organization patent databases. Foreign nationals residing in the United States were named as inventors or co-inventors in 24.2% of the patent applications filed from the United States in 2006, up from 7.3% in 1998. This number does not include foreign nationals who became citizens before filing a patent. The Chinese were the largest group, followed by Indians, Canadians, and British. Immigrant filers contributed more theoretical, computational, and practical patents than patents in mechanical, structural, or traditional engineering. Overall, the results show that immigrants are increasingly fueling the growth of U.S. engineering and technology businesses. Of these immigrants groups, Indians are leading the charge in starting new businesses, and Chinese create the most intellectual property. We have been researching this issue further. Preliminary results show that it is the education level of the individuals who make it to the United States that differentiates them. The vast majority of immigrant founders have master’s and PhD degrees in math- and science-related fields. The majority of these immigrant entrepreneurs entered the United States to study and stayed after graduation. We expect to publish detailed findings this summer. The findings of our studies can help inform discussions now under way on how best to strengthen the nation’s competitiveness. The solutions that are most commonly prescribed are to improve education from kindergarten through high school and especially to add a greater focus on math and science; increase the number of engineers that U.S. colleges and universities graduate; increase investments in basic research; and expand the number of visas (called H1B’s) for skilled immigrants. Improving education is critical. As we have seen from the success of skilled immigrants, more education in math and science leads to greater innovation and economic growth. There is little doubt that there are problems with K-12 education and that U.S. schools do not teach children enough math and science. However, the degradation in math and science education happened over a generation. Even if the nation did everything that is needed, it will probably take 10 to 15 years before major benefits become apparent. Given the pace at which globalization is happening, by that time the United States would have lost its global competitive edge. The nation cannot wait for education to set matters right. Even though better-educated students will be better suited to take their places in the nation’s increasingly technology-driven economy, education is not the sole answer. Our research shows that companies are not moving abroad because of a deficiency in U.S. education or the quality of U.S. workers. Rather, they are doing what gives them economic and competitive advantage. It is cheaper for them to move certain engineering jobs overseas and to locate their R&D operations closer to growth markets. There are serious deficiencies in engineering graduates from Indian and Chinese schools. Yet the trend is building momentum despite these weaknesses. The government and industry need to pay attention to this issue and work to identify ways to strengthen U.S. industry while also taking advantages of the benefits offered by globalization. The calls to graduate more engineers do not focus on any field of engineering or identify any specific need. 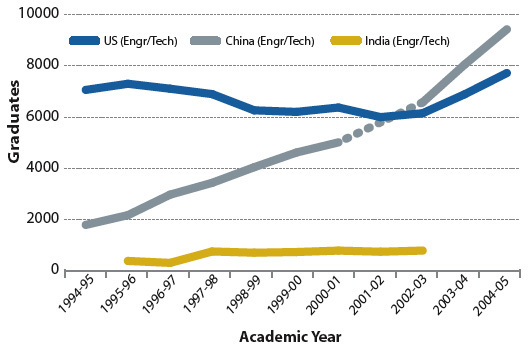 Graduating more engineers just because India and China graduate more than the United States does is likely to create unemployment and erode engineering salaries. One of the biggest challenges for the engineering profession today is that engineers’ salaries are not competitive with those of other highly trained professionals: It makes more financial sense for a top engineering student to become an investment banker than an engineer. This cannot be fixed directly by the government. But one interesting possibility can be seen in China, where researchers who publish their work in international journals are accorded status as national heroes. U.S. society could certainly offer engineers more respect and recognition. A key problem is that the United States lacks enough native students completing master’s and PhD degrees. The nation cannot continue to depend on India and China to supply such graduates. As their economies improve, it will be increasingly lucrative for students to return home. Perhaps the United States needs to learn from India and China, which offer deep subsidies for their master’s and PhD programs. It is not clear whether such higher education is cost-justified for U.S. students. Given the exorbitant fees they must pay to complete a master’s and the long period it takes to complete a PhD, the economics may not always make sense. It is clear that skilled immigrants bring a lot to the United States: They contribute to the economy, create jobs, and lead innovation. H1B’s are temporary visas and come with many restrictions. If the nation truly needs workers with special skills, it should make them welcome by providing them with permanent resident status. Temporary workers cannot start businesses, and the nation currently is not giving them the opportunity to integrate into society and help the United States compete globally. We must also make it easier for foreign students to stay after they graduate. Finally, the United States does need to increase—significantly—its investment in research. The nation needs Sputnik-like programs to solve a variety of critical problems: developing alternative fuels, reducing global warming, eliminating hunger, and treating and preventing disease. Engineers, scientists, mathematicians, and their associated colleagues have vital roles to play in such efforts. The nation—government, business, education, and society—needs to develop the road maps, create the excitement, and make it really cool and rewarding to become a scientist or engineer. Vivek Wadhwa ([email protected]) is executive in residence in the Master of Engineering Management Program at Duke University’s Pratt School of Engineering. Gary Gereffi ([email protected]) is director of the Center on Globalization, Governance & Competitiveness and Professor of Sociology at Duke University. Ben Rissing ([email protected]) is a research scholar with the Masters of Engineering Management Program. Ryan Ong ([email protected]) is a research associate with the Center on Globalization, Governance & Competitiveness. Wadhwa, Vivek, Gary Gereffi, Ben Rissing, and Ryan Ong. “Where the Engineers Are.” Issues in Science and Technology 23, no. 3 (Spring 2007).